Walt Disney himself lived a legendary and highly mysterious life. A man of many secrets, he worked hard to incorporate hidden features through all of his work. Up to this day, there are dozens of special Easter eggs hidden throughout the park. The Imagineer's that designed Disneyland in California have thought through every detail to make the parks as magical as possible. Some of these secrets are meant to appeal to our childhood senses and sensibilities while there are plenty of puzzles to figure out while waiting in those long lines. Take a good look around you, wherever you are, and you're sure to find something with a lot more to it than meets the eye. Every sense is carefully thought through in every section of the park. "The Most Magical Place On Earth' has certainly been designed to live up to the name with specially invented paint, secret apartments, hidden instruments, and an army of adorable mouse-catching cats (although they may have overlooked the irony there). This list includes 25 secrets hidden throughout the park, many of which will be good to remember if you're heading to the park anytime soon. You never know what Walt Disney may have hidden for you to find. Disneyland sure smells pretty great. With thousands of people walking around for hours in the California heat, you would think Disneyland would begin to stink a little bit. However, the Imagineers are very smart. Fully aware of the fact that scent in the sense that most strongly connects to memory, the park has what it calls a Smellitzer - a special machine that pumps specific scents into different parts of the park. 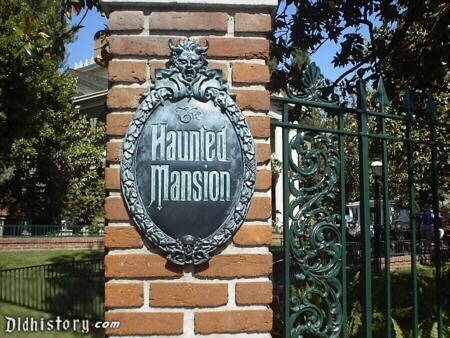 The Haunted Mansion smells musty while Main Street is scented with the smells of fresh bread and popcorn. Not everyone on Disneyland's payroll is strictly human. There are hundreds of cats that live throughout the park (who are almost certainly not on the payroll), intentionally allowed in the park to keep pests away. If you're concerned about the stray cats you've been seeing throughout Disneyland, don't be. They are definitely supposed to be there, and they are definitely being taken care of. No one knows exactly how many cats there are across the park, but they are beloved members of Mickey's team, even if they're meant to take care of the, you know mice. Gum is notoriously hard to clean up so the park just circumvents the whole issue by not selling gum in any of the park's stores. There are not one, but two time capsules buried under the park. The first was buried in front of Sleeping Beauty's castle when the park turned 40 in 1995, while a second lies under the Buena Vista Plaza, buried in 2012. The most recent one is meant to be unearthed in 2037 after a quarter century. There are plans to keep burying time capsules throughout the park as the current ones are eventually reopened in the future. If you want to know what's in it, just wait another 18 years. The park really wanted to go all-out and make the simulator as real as possible, even while you're standing in line. Walt Disney named this specific train car after his wife, Lilly Belle. This beautiful Victorian-style train car is quite special for several reasons. Not only is it extremely exclusive (unless you're part of a specific club, you'll need to be one of the first people in line at opening time to get a chance at a ride), the car is packed with one-of-a-kind artifacts from Disney history such as old scrapbooks and family photos. Walt Disney himself was awfully interested in the future (and who knows, maybe he'll get to see it) and invested quite a lot into Tomorrowland. There are plenty of small details that he planned across this section of the park, but the coolest detail is the fact that every single plant in Tomorrowland is completely edible. Part of Disney's future fantasy involved completely sustainable agricultural technology, which he turned into a reality in this park. If you want a small snack, anything green will work. If Sleeping Beauty's Castle looks real-if not extremely colorful-that's because it pretty much is a real, functioning castle. One small known fact about it is that the drawbridge is in perfect working order. However, it has only been used twice in the park's history so, chances are you won't be able to see it ever raised. Part of the mystery of the 33 Club revolves around its awfully subtle entrance. The door is painted with a very specific and intentional shade of green called "no see "um green' that was created by Disneyland to mark "no-go' zones. The color is scientifically designed to be, well, boring. Your eyes will naturally scan past this color so it is used to mark electrical equipment and employee only zones. Walt Disney coined the term "Weenie' to mean a landmark in the park that is designed to catch your eye immediately. The story goes that he used to play with his pet poodles with hot dogs out of his fridge and their eyes would follow wherever the hot dog went. In this scenario, we are the poodles and these landmarks are uncooked hot dogs that we're supposed to follow. One engineering secret employed throughout the park makes many of the buildings look a lot bigger than they actually are. Many buildings, including Sleeping Beauty's castle are made thinner the higher up they go and utilize smaller material. This results in an optical trick that makes these places look way larger than they actually are. The castle spires shrink in diameter, making it seem taller and also farther away than it actually is. Of course, this means that there are some strangely small rooms in all of these buildings in the second and third floors. Of course, it doesn't actually steer the boat, but it's definitely a fun addition, especially for younger passengers. Not only can you steer the Mark Twain riverboat, but you can also hang out in the front car of the Monorail that zooms around the park. Again, ask nicely and you just may be permitted into the conductor's car with whoever is conducting at the moment. This one is real so unfortunately you can't take the wheel (or buttons or sticks or whatever it is) yourself, but it's still a pretty cool sight to see from the front of the monorail-a sight very few people ever get. Just about every restaurant through Disneyland has special secret menu items available to those in the loop. If you're visiting the park, it's worth asking about a hidden menu item at any restaurant you go to in the park. Many of these items are (obviously) Mickey mouse themed such as the bread bowl, but there are dozens of these such as loaded tater tots and ice cream nachos. It's always worth a shot, but like with many of these secrets, the nicer you are to the staff, the more likely you are to get in on the good stuff. "Caution. Do Not Pull Rope! Handling Fragile Artifacts." What should you do? Pull the rope, obviously! In the queue for the Indiana Jones Adventure, there is a well with a rope sitting by this sign that not many people pull. However, if you do, there is a secret message for you and if you keep pulling it, you'll hear a large splash from down in the well. There is another spot in the line with a similar trick having to do with a bamboo pole that can crash the ceiling in around you, sitting there waiting in line. If you're like me and had nightmares of this freakish ride, then thankfully, there is a secret hidden in it to make the teacups from hell slightly more bearable. The designs on the cups are associated with different speeds, so you can intentionally choose the slowest of the teacups or the fastest, if that's your cup of tea. The orange cup with diamonds as well as the purple cup with flowers spin the fastest, while the pink and gold cups with hearts are significantly slower than the rest. The fountain at the center of Mickey's Toontown has a statue of Mickey with several instruments in a Fantasia-like ensemble. Remember these instruments when you're walking through Toontown, because there are several manhole covers inlaid with these instruments. If you see one, feel free to jump on them and you'll hear a quick tune of that respective instrument. This is a secret component that's frequently found out about by accident, but the complexity of the system is still one of the smartest installations in the park. There are a lot of ways to bump up your score on the Buzz Lightyear ride like knowing which kinds of targets give the most points (triangles and diamonds are worth way more than circles and squares). If you're really going for the maxed out score of 999,999, then you pretty much have to know about the two special 100,000 point targets on the ride. The target on the left hand of the orange robot and the one on the bottom of Emperor Zurg's Spaceship both give massive points. Disneyland really cares about the details and insists on being as pleasant as possible on all of your senses. The park shoots wonderful smells at you, tricks your eyes into seeing the buildings as bigger than they actually are, and it also embellishes the sounds as well. The park is designed with even the most minute detail in mind, including the sound of the horse's hooves. Perhaps the best known "secret' across the park is actually hundreds of secrets. There are Hidden Mickeys everywhere in the park. From paint splatters, to silhouettes, to carpets, anywhere you look, you'll be able to see at least one Hidden Mickey in plain sight. The park is designed with this minute details in mind so even when you're standing in line for an hour and a half, at least you always have a fun scavenger hunt to keep you entertained and happy.